Poplars and Rocks is back from a summer break at Madame Claude! Back with Programmed for Pleasure and Nanu Nanu. Programmed for Pleasure is the musical project of Carvin Wetlands. It began around 2003 in Los Angeles. After performing several shows and releasing an EP, the band dissolved and transformed with the head and singer moving to Europe. 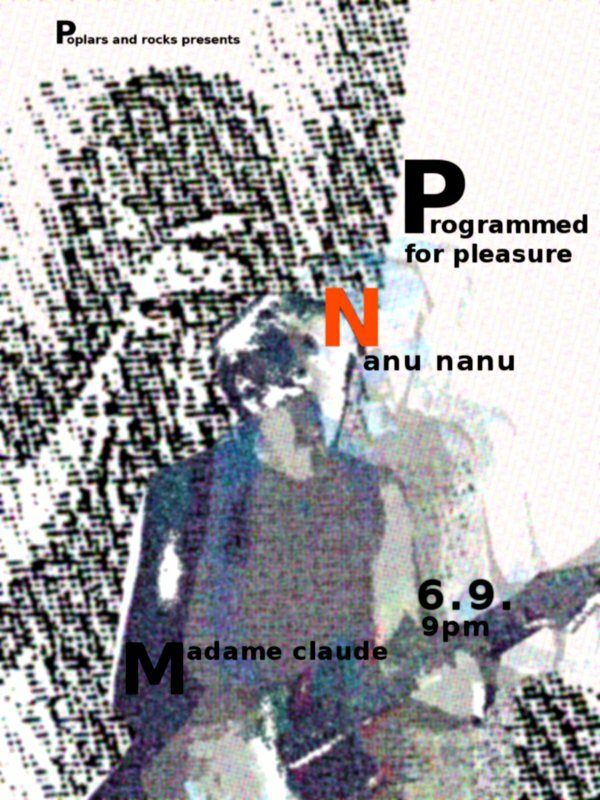 Meanwhile in Berlin, Programmed for Pleasure is still there with new material and members. Latest new member is Colm Rutledge, guitarist in several bands, such as Humanzi, and his own project Suzie’s Ashes, with which he is going to release his debut album very soon. Programmed for Pleasure’s last EP, City of Witches, was released 2012. Their music roots between Can, Jesus and Mary Chain, and Sisters of Mercy. Programmed for Pleasure took its name from a movie in which a robot is created by man, who ends up controlling it’s creator. Beware. Nanu Nanu are an electro pop duo from Dublin, Ireland, calling themselves what they do „alien pop“. They started off around 2010, and, after massive touring in UK and Ireland, have this year released their debut album, Unit 1, on independent label Flaming June records. It’s their first gig in Berlin. 6th September 2013, 9pm, Madame Claude, Lübbener Strasse 19, Berlin. Admission is free donation, bands are on at 10pm sharp! On decks Rad Spin Rotate Club.